Thumbies fingerprint keepsakes give you the opportunity to make a custom keepsake of the people you love and the times you want to remember. These customized, keepsake charms are created using real footprints, handprints, or fingerprints. 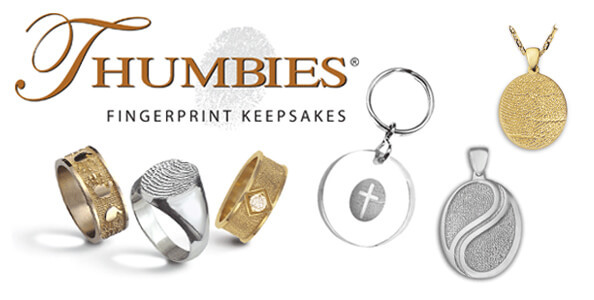 Crumpler - Honeycutt Funeral Home is part of Meadow Hill’s nationwide network of funeral homes that assist families in taking fingerprints and placing orders for jewelry keepsakes. The charms and Thumbies items pictured here are just a sampling of the variety of keepsakes that are available to you. We have brochures and information available for a more complete selection of choices. These keepsakes don’t have to be used only as a memorial item after a loss. You can have your children or grand-children’s fingerprints (and even your pets paw or nose prints) put on a charm to wear and cherish now. Creating Keepsakes Three-dimensional Thumbies are crafted from simple ink fingerprints, footprints or hand prints using the time honored process of lost wax casting. The finished pieces are ever so touchable, making real our memories at each stage of life’s cycle. Children’s Prints There are few things as irresistible as keYG Family Ties 5 Printepsakes that capture the tiny hand prints and footprints of newborns and toddlers. Youth and Young Adults The fingerprints of young people are clear, the ridges well defined. Keepsakes created at this stage help parents deal with the empty next. Middle Age As we age, fine lines begin to appear across the surface of our fingerprints, making our prints even more distinctive. The Elderly As our loved ones near the end of life, the ridges of their prints grow fainter and the “life” lines more pronounced. We imagine their prints telling the stories of their lives.